Marvel has never been afraid to shake things up but an all-inclusive universal re-boot is one thing that many of us thought we would never see but, here we are two issues into what could be the most massive event in comic book history. The House of Ideas is a moniker that has become more fitting than ever, that is not to say that all of them have been brilliant but, certainly there has been much more to applaud than complain about since Secret Wars crept back into our collective consciousness thanks in large part to Jonathan Hickman and his ground-breaking work on the Avengers’ titles where the majority of the set-up for this epic event took place. Hickman is a consummate storyteller, blending super hero tropes with high fantasy and mind melting science fiction; essentially he is a very smart guy who writes smart comic books for other smart people or at least those of us with a head for the heady. Secret Wars is the result of an exhaustively researched and meticulously detailed narrative with its roots running through most of the Marvel Universe including and pre-dating the first Secret Wars. More marketing ploy than story the first Secret Wars is largely panned by serious comic book readers, many Marvel fans included, however nostalgia can be a powerful force; so as many of us who were children the first time around have grown and matured in our reading choices, we now have an absolutely phenomenal version of Secret Wars to experience from the inception to the fall out, but will Jonathan Hickman have a place in the post Secret Wars Marvel Universe, it appears not. His name is conspicuously absent from every All-New All-Different Marvel title. A good deal of the titles making up this first salvo of Secret Wars offerings have been absolutely fantastic; Duggan and Weaver’s Infinity Gauntlet is an engrossing tale of one family’s resilience in the face of insurmountable odds. 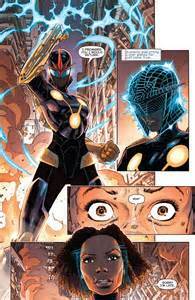 The mother of two young daughters, herself an officer in the Nova Corps returns to her husband and children only to find devastation as the result of an all-out alien invasion. She shares her Nova powers with her family including Zig Zag, the loyal family German Shepard and off they fly to Nova headquarters; unfortunately the once bustling hub is now in ruins. Things escalate as an Infinity Gem comes into play which attracts the attention of perhaps the biggest baddy of them all, Thanos. Duggan does an extremely solid job of endearing this family to us almost immediately; they are likable and very authentic in their flawed humanity. Their strength comes from their bond as a family and that comes across so well through Duggan’s brilliant dialogue. These characters are real and you want them to succeed but even more than that you feel like you are struggling with them. Weaver’s art is gorgeous full of kinetic energy and dynamic style. His character designs are wonderfully hip with an urban sensibility that blends graffiti style with traditional super hero elements to genius effect. 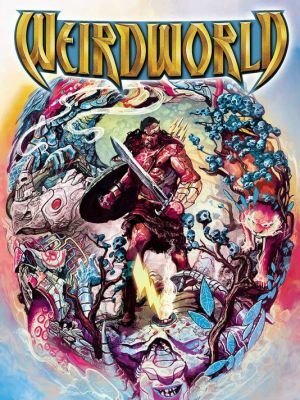 Another title I was really impressed with is Weirdworld written by Jason Aaron with some of the most unique and imaginative artwork I have seen in quite a while by the always-inventive Mike Del Mundo. I first discovered his work on the all too short lived Elektra series, his images flow organically across the pages, panels dissolving into one another in a blissful ballet of kinetic chaos, equal parts Dali and Ditko. The narrative is Aaron at his best calling to mind the most ingenious issues of his Thor run. As impressive as much of the Secret Wars titles are and seem to be continuing to be, many of us can’t help but wonder what is next for our beloved Marvel Universe. In the wake of the Incursion event that wiped out the 616 and the Ultimate Universe there has to be something more, right? Of course there is don’t worry True Believers the Mighty Marvel machine marches on, however it will certainly be an All-New All-Different Marvel as promised. Many of the most prolific creators will be returning but not necessarily to the titles or characters that they were formerly working on. Let’s take a look at where some of the big guns will find themselves in the aftermath of Secret Wars shall we. First up BMB, Brian Michael Bendis will be taking his ample writing talents over to Invincible Iron Man along with artist extraordinaire David Marquez. I’m really looking forward to this one; of course we know Bendis is no stranger to writing Iron Man as a character but to get an on-going solo Iron Man book from the BoMB is definitely something to get excited about. A-Force which very recently debuted will be getting a new number one which will be written solely by G. Willow Wilson with art by Victor Ibanez. This looks to maintain the status quo set up in the current series as far as team members and dynamic. 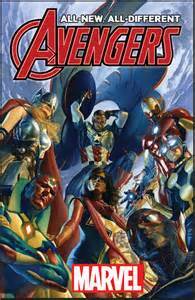 The same cannot be said for the All-New All-Different Avengers written by living legend Mark Waid with art by fan favorite Adam Kubert. This team does not even resemble any Avengers team currently assembled beyond the inclusion of Captain America albeit Sam Wilson and Iron Man, rounding out the rest of the new squad is Ms. Marvel, Kamala Khan, Spider-Man, Miles Morales, Thor, Jane Foster and Nova, who I believe to be Sam Alexander but I could be mistaken as I have no confirmation on that at this time. This team certainly has diversity but will it have chemistry? That remains to be seen, however I have the utmost confidence in Mark Waid to deliver an engrossing story full of authentic characterizations. 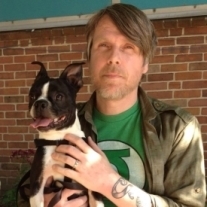 Gerry Duggan, half the writing team that brought us Deadpool will be handling the writing duties on Uncanny Avengers along with artist Ryan Stegman. With Duggan at the helm it should come as no surprise that the Merc with the mouth himself is a part of the eclectic roster which also features old man Steve Rogers, Rogue, Brother Voo Doo, Quicksilver, the Human Torch and Spider-Man/ Peter Parker. This book is sure to be over the top in both excitement and humor; Duggan and Stegman have proven themselves to be major creative forces in the Marvel stable so I am anxious to see what they do in a collaborative effort. Writer Al Ewing will be taking on New Avengers as well as Ultimates both of these titles features some pretty amazing visuals, the former by Gerardo Sandoval, the latter by the brilliant Kenneth Rocafort as he moves from DC’s Teen Titans to Marvel’s Ultimates. I will be picking this up for the artwork if nothing else. 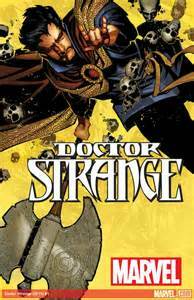 Jason Aaron and Chris Bachalo will be teaming up on Doctor Strange #1. This is major; this is one of those books that just cannot miss. Doctor Strange has always been a great character but it has been way too long since he has had his own on-going title. This creative team is pure gold so expect big things from this book. Captain Marvel will be back but without Kelly Sue DeConnick, this time Carol Danvers will be written by Tara Butters and Michele Fazekas with art by Kris Anka. I’m not sure what to expect from this creative team but I will certainly be there for #1 at the very least. In one of the most innovative turn of events Amadeus Cho will be The Totally Awesome Hulk, this could be, as the title implies, totally awesome especially being written by Greg Pak who did such a great job writing the Hulk before albeit a different Hulk altogether and handling the art chores is the incredibly talented Frank Cho. This is another one I’m super excited about. These are just a few of the titles that will be coming from Marvel in the days to follow Secret Wars but this is by no means an exhaustive list, far from it in fact. Look for new titles featuring Carnage, Spider-Man both Peter Parker, by Dan Slott and Miles Morales by Brian Bendis, a new Deadpool #1 by Gerry Duggan and Mike Hawthorne is on the horizon and looks to be more fun than a sack of rabid weasels, Spider-Gwen, Spider-Woman and Silk will all be getting new number ones as will Daredevil written by Charles Soule with art by Ron Garney, Bendis will also be returning to Guardians of the Galaxy however the team will not be quite the same, Hawkeye, Thor, Scarlet Witch and Ant-Man will all see fresh starts in the All-New All-Different Marvel Universe as well. Wow things are changing around the House of Ideas but one thing that will never change is Marvel’s commitment to deliver the most entertaining comic books bar none. Since the days of the spinner racks when a dollar and change could get you three issues, I have been making mine Marvel and while I definitely buy and enjoy tons of titles from other publishers there is something undeniably different about Marvel Comics; its indefinable but you feel it when you read a Marvel comic or watch a Marvel movie or television show, it’s the excitement of experiencing these adventures with heroes we love so much and villains we love to hate. Marvel is modern mythology that reflects everything from our politics to our fashions; it spans generations and sparks imaginations all over the globe. If there was ever any doubt that the Marvel Universe would continue on after Secret Wars rest assured my friends the ending of this story has yet to be written. 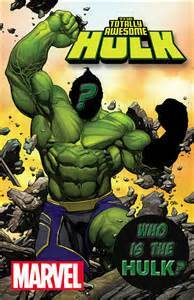 This entry was posted in columns, Comic Book Reviews, marvel comics, shawn warner and tagged Marvel Entertainment, secret wars, shawn warner. Bookmark the permalink.